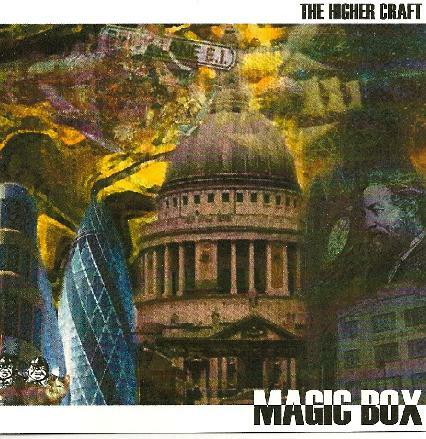 The Higher Craft - "Magic Box"
The Higher Craft are a quintet from England that includes Christina, formerly of Peyote Mothership, Craig on guitar, plus other members I'm unclear on, though some are former members of Magic Mushroom Band. The album opens with "Time Has Come", which has a gorgeous grooving psychedelic vibe that reminds me of the 80s UK festie psych bands. But hey, they've got former members of Magic Mushroom Band so what do you expect?! "Lazy Daisy" and "Senorita" are both heavy duty rockers with awesome vocals from Christina, which strike me as a cross between Grace Slick and Damo Suzuki. Seriously… it's her vocal style, her delivery, that reminds me of Damo. Like a form of jamming itself. Very cool. Ditto for the nearly 11 minute "I Do The Visions", with its killer rhythm section and mind-bending Hillage styled guitar. An excellent psychedelic jamming groove and you can DANCE to it! "Poetic Justice" has a west coast psychedelic feel, with the band jamming along like the Grateful Dead, but Christine's vocals make the music oh so much trippier. Nearly 10 minutes of cool groovin' jamming. "Planet Clairvoyant" features a freaked out trio of bass doing the Peter Gunn theme, wailing sonic mayhem guitars, and Christina's vocals. "Infinite Blue" is a short Bluesy boogie woogie rocker. And "New Moon" is another lengthy 10 minute stretch out tune. This is slow paced mind massage music with a jazzy but ultra trippy psychedelic vibe. A thoroughly relaxing grooving magic carpet ride. Round it all out with a cool cover of "White Rabbit" and you've got one of 2008's standout psychedelic albums. Highly recommended. This CD is a real surprise winner for me. Craig and Christina after they left Peyote Mothership have created a real psychedelic rock classic. I am not sure who played the drums and bass as it is not mentioned anywhere. Time has Come starts the psych rock journey off. I just love Craig's really groovy and melodic guitar lines along with the bouncing bass line a bit like some GONG stuff. Lots of great psychedelic lead guitar as well. Lazy Daisy kicks it up a notch and is a real driving rocker with nice vocals and guitars. Poetic justice is more laid back but it has such a cool lazy, stoned and psychedelic groove and feel to it. I just got sucked right in. Planet Clairvoyant uses a very popular bass line but the band takes the road trip to another place all together. Some quite psychedelic stuff here. I do the Visions is the longest track at nearly 11 minutes and starts off like an Acid Trip, very trippy and then the bass line comes in and the track takes off. Craig plays a killer solo. Infinite Blue is a blues psych thing and the sound changes quite a lot from the other tracks. Not sure if it was recorded somewhere else? Strange. Anyway, it becomes a real barnstormer of a jam but the guitar is mixed too low for my tastes. New Moon is a dreamy track and very laid back and spacey track. Senorita is a uptempo psych rocker. The CD ends with the band's interpretation of the classic Jefferson Airplane track, White Rabbit. Amazing debut CD, more please.. This is my current favourite CD.